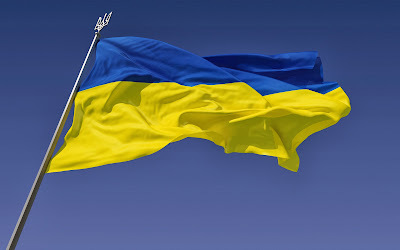 Ukraine is not yet dead! Here's video footage of unarmed Euromaidan demonstrators being gunned down in Kyiv. After they are pinned down, they are picked off by snipers. Here's video footage of snipers and militsia shooting at Euromaidan activists, plus scenes of victims alive and dead. Lew Rockwell, "anti-war" Justin Raimondo, senile old Ron Paul, and paranoid lunatic Paul Craig Roberts find this acceptable. The Kyiv Post website still is up and running as a write this (11:30 EST). I expect they'll be taken down at some point. The press coverage of Ukraine is terrible in the U.S. It is treated as if it's a political squabble between, say, the Democrats and Republicans that has somehow gotten out of hand. It's not. Here's how it could be translated into American terms: Suppose that in 2016 Hillary runs against, say, Ted Cruz, and wins. Three years later the situation is that Cruz was sent to prison shortly after the election on trumped up charges, we learn that Chelsea Clinton is now the richest person in America, that the Clintons and their friends own over 50% of the American economy, and that Hillary is about to sign a deal that turns U.S. security over to China. When we assemble and begin peacefully demonstrating, there begins a stream of daily abductions and disappearances, with victims turning up tortured or dead or not turning up at all. Then the police suddenly violently attack, killing a number of demonstrators, right after Hillary promises us she will listen to us and resolve this peacefully. Next, an "amnesty" bill is passed by Congress, except only a minority of Congress is in attendance and they are all Hillary supporters. The amnesty supposedly is for demonstrators, but when we read the fine print we realize it covers the security forces almost exclusively. And besides, we demonstrators are not afraid of prosecution, we are now afraid of being abducted by death squads after we go home. They are now finding bodies on the trails I used to run. I keep hearing this crap about how this "suddenly" turned violent -- in fact, attacks and disappearances of people opposing Yanukovych have been a daily occurrence. Now the Berkut and Interior Ministry forces are gunning down demonstrators. I'm extremely worried for my former students, some of whom were giving free economics lectures at "Open Maidan University" at Kyiv's Euromaidan. They are likely in mortal danger, and should Yanukovych triumph I expect they'd face violent retaliation. If you really want to understand what is happening read Rutgers Professor Alexander Motyl's analysis. I hope he is right about the downfall. 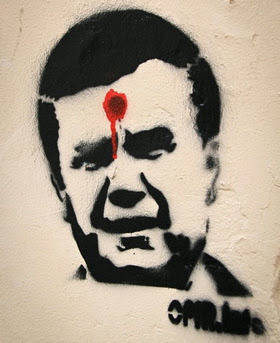 Yanukovych is Putin's puppet in many respects -- he is taking orders from Putin on this. The Russian FSB and special forces are certainly already at work in Ukraine, and Putin has much to lose here. I suspect Putin is not hesitant about spilling oceans of Ukrainian blood if needed for his scheme of rebuilding Soviet power, his Eurasian Union project. Needless to say Lew Rockwell's "anarchocapitalists" (a.k.a. apologists for Stalin and Putin) are defending Yanukovych's brutal dictatorship. What a disgusting and evil spectacle -- anarchists for the kleptomaniacal police state. Ugh. What's it like to be clubbed unconscious by thugs? And what's it like to abducted by a death squad? Or to be beaten by one while fighting to prevent one from abducting your husband and friends? Did you ever wonder what that might be like? I think this is really a life or death situation for Ukraine. The alleged amnesty means nothing, as Dubrovskiy points out. Protestors and activists cannot simply give up now and go home. If they do they'll eventually be hunted down and punished, extra-judicially. Yanukovych and his puppet master, Vladimir Putin, will run Ukraine as a brutal dictatorship on the Lukashenka/Stalin model. Ukraine will be a kleptocratic dictatorship if Yanukovych is not brought down... brought down, as in removed from power, because he really is the maniac Chornovil describes. There can't be any compromise agreement with such a maniac, because he'll renege and destroy you at first chance. Finally, one more piece, by Anton Shekhovtsov, in which he documents the hand of Putin in disinformation campaigns being conducted in the West. It's interesting -- but not surprising -- that both left-wing and right-wing "experts" are involved. Note that one of Putin's mouthpieces is Daniel McAdams of the "Ron Paul Institute," and a frequent writer on Lew Rockwell's site. It's not at all surprising that these worms turned up when Shekhovtsov looked under a few rocks. Rockwell's site (and its sister site, AntiWar dot Com) have regularly condemned the Ukrainian protestors and supported Yanukovych and Putin. That's not news, and I won't link to their drivel. Far worse, Doug Bandow of Cato wrote an utterly uniformed, unprincipled, and ultimately disgusting piece in Forbes on why there are no important issues for the west in Ukraine. In the course of his piece he managed to say that Russia is actually behaving very nicely to Ukraine; after all, didn't Putin offer Ukraine financial assistance? OK, we expect pro-Soviet drivel from pseudo-libertarians like Rockwell and Raimondo. But from a Cato Senior Fellow? Indifferent people, please understand this faster and start to care... those of you who are indifferent should not stay away when the bells are ringing. When there is still time to stop the most horrible. Because it has not reached your turn yet, but it definitely will, even if you don’t care. Happy New Year -- Gregorian, Julian, and Chinese! Why the silence from Unforeseen Contingencies? I haven't been blogging because I've been overwhelmed with a number of other activities. I expect to get back to it on a more regular basis this month. I have an enormous backlog of ideas I want to write about, plus there are so many current events screaming for commentary that I don't even know where I'd begin. No, that's not right at all. I know exactly where to begin, as my next post will show.